You don’t have to feel limited to knitting squares if you’ve just learned to knit. There are tons of easy knitting patterns for beginners. Garter stitch is the first basic knitting stitch that any knitter learns. It also happens to be simple and beautiful. To prove it, we’ve collected a handful of simple knitting patterns for your knitting pleasure. The patterns are not my own but are from generous designers who have graciously shared their work. If you have questions about a specific pattern, please contact the designer directly. This easy knit hat pattern on straight needles is the ultimate beginner project. With adjustable sizes from baby to adult, you can make this for your entire family. Want it more slouchy? Less slouchy? No problem. You can , too. 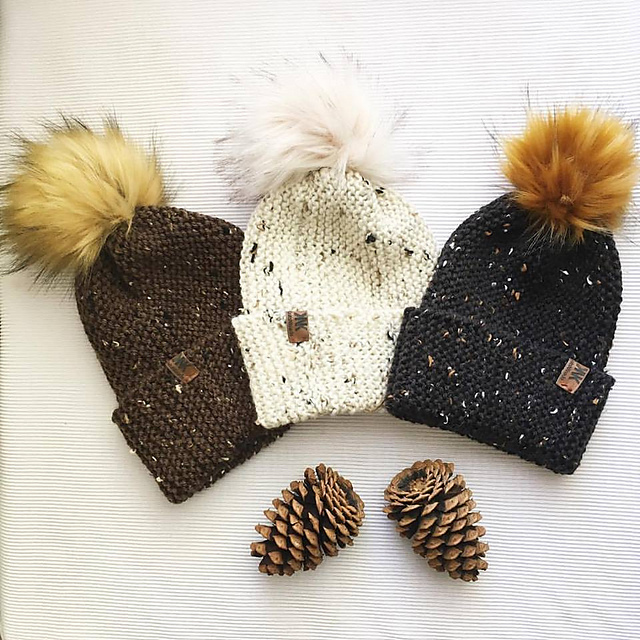 Knit in worsted weight yarn and with a fun faux fur pom, it’s sure to be loved in any size or color. If you love a snuggly scarf in the wintertime, this free cowl knitting pattern will definitely warm you up. Knit on straight needles in bulky yarn, it is a simple garter stitch repeat. You will be finished in no time. Want it longer or shorter? You can adjust the length to your preference. And when you’re done, just seam and embellish with beautiful buttons. No buttonholes required. Looking for a basic knitting pattern for a scarf? Look no further. This lovely oversized blanket scarf is knit while holding two strands of each color making it warm and cozy. Think of all the color possibilities! If you’re looking for a shawl knitting pattern, then the Humble Beginnings Shawl is a great place to start. This quick knit shawl is so simple to do. The only additional technique you’ll need to know is how to yarn over, which you can master in an instant. Ready to challenge yourself a little more? Then try this lovely garter stitch shawl knitting pattern. Knit in worsted weight yarn on size 7 or 8 knitting needles, this is a great project to practice your knitting. Like the shawl above, you'll need to know how to yarn over. You'll also need to learn how to knit through the back loop, but it's easier than it sounds. Challenge yourself! Learn new techniques and knit more beautiful things. We know you can do it. 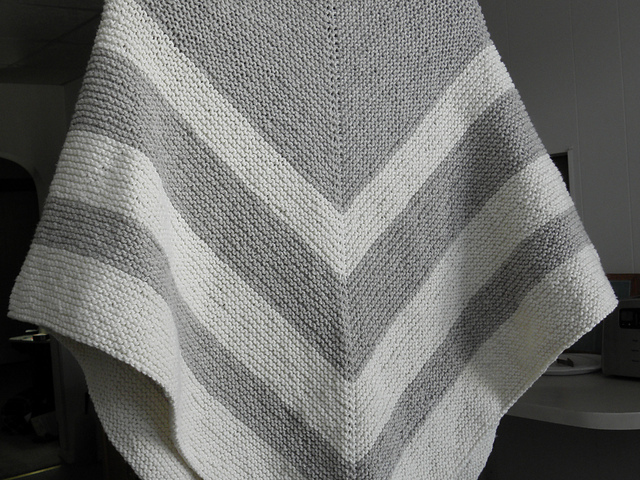 Are you ready for an easy baby blanket knitting pattern for beginners? 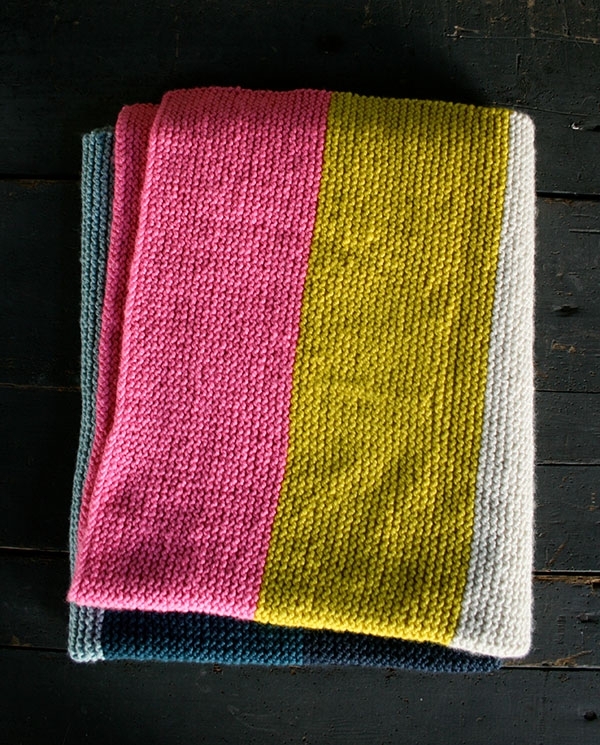 This colorful garter stitch baby blanket is big love in my book. With so many color palettes to choose from, you can mix it up any way you like. Knit in super bulky yarn, this project will work up quickly. Then you can make more! We told you garter stitch knitting could be fun. We hope you enjoyed these easy knitting patterns for beginners. Ready to take the next step? Learn how to purl with our easy photo tutorial. Then check out these knit purl stitch patterns for more inspiration!